Mr. Pak, who has been employed by Marvel Comics for quite a few years now and has contributed, or collaborated on, several noteworthy works of comics goodness, including but not limited to co-writing the recent Incredible Hercules and an outstanding, as well as overlooked, take on Jim Starlin’s version of the Adam Warlock character via a 2004 (wow, has it been that long?) miniseries, has been pushing this to all who will listen via his Twitter account. And you know me, I can never resist a freebie, especially if I’m looking for something comics-related to write about, so I took the bait. For the most part, I’m glad I did- this is an interesting take on the whole what they used to call “virtual reality” and today’s pervasive social media, as well as issues of intellectual property ownership, piracy of said property, government intervention seeking to regulate and of course profit from same, and other relevant-to-today issues. Set in an unspecified future, the “Sprout” (read: Apple) corporation has created a filmmaker’s dream- a pair of glasses (called “iEyes”, ay yi yi) which “turns your eye into a video camera…and your brain into a digital editing and special effects suite”. “All you have to do is imagine it…and it happens.” Quote unquote. The results of what one imagines can summarily be uploaded and shared with all others who wear the iEyes; oh, if only those things were around when Jack Kirby was alive. Anyway, the focus is on three (naturally) young good looking people, two boys one girl, who happen to be film students and thus most desirous of these wonder specs, and at first this is about how they choose to employ this tech. Then of course, as they are wont to do, the Powers that Be aka the Government seeks to pass legislature which creates a situation in which they profit from all this, and then down the road there are even more nefarious scenarios that come into play. Eventually, the Apple/Jobs analogue (except far more attractive than either Jobs or Wizniak) Face of the Company realizes what is happening under her nose and seeks to make things right, the young girl (as well as the sinister forces) realize that she has powers that go above and beyond the norm, ala telepathy, and seek to exploit her talents (a late scene with her reminds me a bit of Terry Gilliam’s Brazil)…and while it all threatens to collapse into a big writhing mass of incoherence, it somehow doesn’t, and the ending resonates nicely. Credit is due to Silva and his inkers/Photoshoppers for keeping it all in line visually; he contributes some nicely imaginative pages and layouts in places, and while I generally don’t care for that pseudo-manga style he brings, he at least does well with facial expressions and body english. An aside: whenever I see the credit for that “Dym” (or is it “DYM”?) person, my mind conjures up the image of the big fellow from A Clockwork Orange, one of Alex’s droogies, hunched over a drawing board, slopping ink all over everything. Anyway, in a nice touch considering the gist of the story, Mr. Pak is choosing to release this under a Creative Commons license, and you won’t need a pair of expensive iEyes to read it, just a computer to download. Click the link above (in the credits) for you very own PDF that you can share all you want. IEye, sir! A take on what in some ways is the same thing as Vision Machine; we’ve had several of these recently and we’ll have many more, I’m sure, before long. Today’s social media phenomenon, as well as the popularity of the film The Social Network and all the back-and-forth about internet availability of music, movies, and comics has certainly gotten a lot of people thinking about the ramifications. Plus, it’s a buzzworthy topic, and theoretically one which might spark some interest in what is basically an obscure comic by some obscure creators, a ridiculously hard sell in today’s market. This one’s by Nick Spencer, who’s also writing the curiously popular Morning Glories, and he’s good enough here that it shows perhaps that he’s an author to keep one’s eye on. As I understand it, the difference between this and Vision machine is that here, one is able to insert oneself into a multitude of different realities; Machine seems to work in a different direction in that there, people create their own. For example, if you’re sitting in the stands at a baseball playoff game, and someone hits a payable foul ball and you reach out for it and accidentally prevent the outfielder from catching it, well, rather than endure the shitstorm, you can punch up a different reality via your phone app and for a nominal service charge, you can enter a reality where you stay in your seat and the name “Bartman” is no longer legend. Our POV character is “Mike”, who is a regular user of the service but can’t seem to insert himself in any reality in which he’s happy; in fact, a goodly number of them end up with him dead (he’s attended his own funeral several times, he tells us), which is troubling. What troubles me is that I’m never exactly sure (and it’s not really explained, even by the clever real-life photo fellow they bring on early in the narrative to give us a sales pitch) what level of reality that this stuff occurs on- is this all in his mind, and is his body somewhere safe or unsafe? It says he’s inserting himself into lives in other dimensions, ones that I presume are vacated by other users, but the whole physical nature of the human existence and how it manifests itself in all this eludes me. Oh well. When you go with the flow, as you so often have to do with this kinda stuff, this is fairly engaging; “Mike” is likeable enough, in his “Shaggy” Rogers way, and that helps a lot. 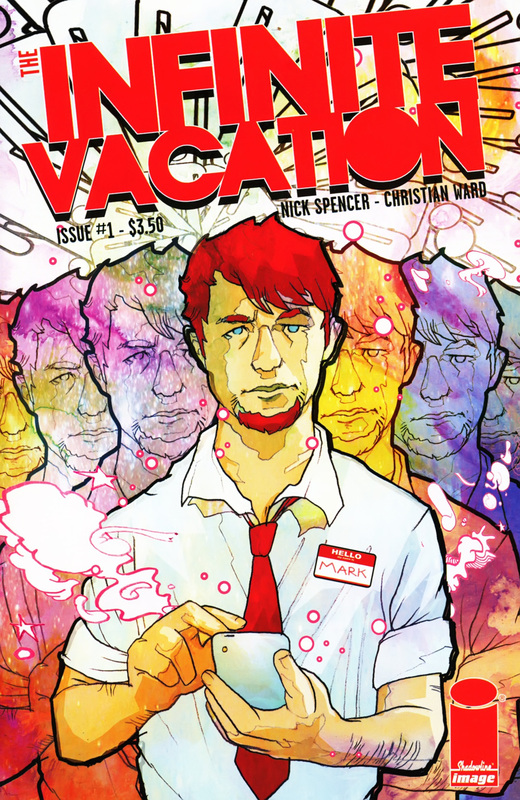 The whole impetus for the second half of the book and I presume at least the next issue- Mike meets a girl in a coffee shop, strikes out, and before he can shift into a new reality in which he doesn’t, she stops him and gives him a ton of crap for his lifestyle choices, she being a “Deadender”- not one of the cast of the sadly lamented cancelled DC/Vertigo Ed Brubaker/Warren Pleece series, but someone who rejects this reality-skipping technology- and its abrupt interruption, is interesting enough, I suppose. I can’t really decide if I like the art or not- Ward draws with a sloppy, unfinished-looking yet imaginatively designed style that reminds me a bit of Jock or perhaps David Mack after about seventeen bloody marys; for every clubfoot or odd facial expression there are knockout spreads like the one on pages 6 and 7; garishly colored and seemingly inked with a fat-tip Sharpie marker, but no less interesting to parse for it. I also liked the inside front cover, which is arranged like some sort of digital store on an iPad and features a nicely realized, and a bit humorous to boot, interface. I’m sure this will raise a lot of the same issues that concern any of us who spend an inordinate amount of time here on the ol’ World Wide Internet, and Mike will go on some sort of vision quest and realize some sort of life lesson and it kinda writes itself. I hope Spencer has some curves up his virtual sleeve, or else I’ll dial up the app and put myself in a reality where I didn’t cough up tree-fitty for this comic. You can go here for an interview with Mr. Spencer, and hopefully he can explain all this better than I. 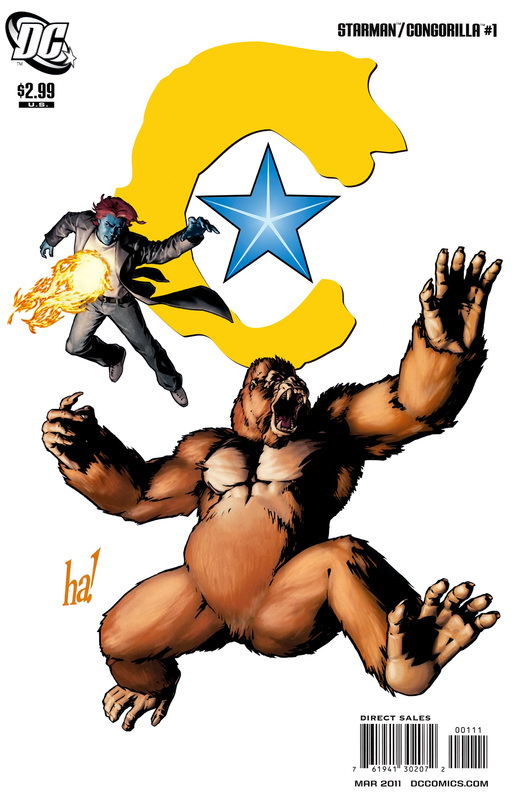 As with the recent Blackest Night: Starman #81 one shot from a while ago, it’s pretty well established that my fandom for Robinson’s reputation-making series is such that I will even continue to buy whatever kind of spinoff he’ll foist on us, regardless of the actual quality of said spinoff. Fortunately, he’s resisted going to that well very often, and that one-shot, which featured the Shade, was pretty good. This? Not so much. It’s not as bad as I thought it might be, though, and in a way, it’s kinda hard to really work up much dislike for this quite obscure book featuring a clutch of obscure characters, bought only by completists and those who might be invested enough in whatever JLA story (Omega, I think it is, actually) that this is a peripheral part of. I liked the cover, one of this month’s cover gimmick series which features a white background and a big logo of sorts to represent these “iconic” characters, ha ha, like Congorilla. This one’s by Gene Ha, which usually always ensures cover goodness. 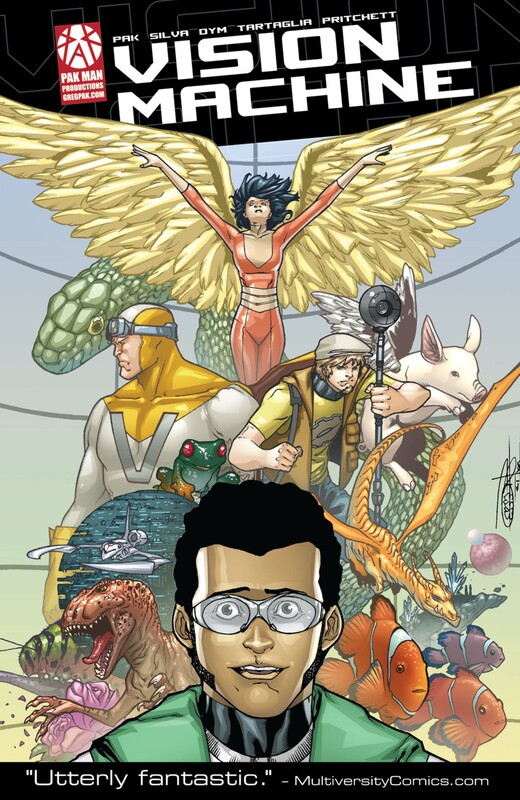 Anyhoo, we join the big golden monkey and Mikaal Thomas, apparently the only Starman Robinson will condescend to write these days, as they seek not only one of Congorilla’s friends from Gorilla City, but the Fountain of Youth (it’s actually a Lazarus Pit, yep) with Animal Man, some Middle Eastern speed guy named Sirocco, and of course Rex the frigging Wonder Dog in tow. All this leads to the big reveal (OK, it’s more of a little reveal, but it probably means more to those who have been following all the big mega-events of the last few years) towards the end of a previously-thought-dead hero, miraculously returned to life! And off we go. Even though this seems to be jam packed with beings in constant motion, bickering, fighting, etc., not a lot really happens and Robinson chooses to annoyingly employ constant cut-in flashbacks (4 hours, 45 minutes ago! 2 hours ago! Now!) to tell his story, against all odds I latched on to Robinson’s still-strong sense of how to write character interaction (Cry for Justice being the exception, I guess)- and swam through the story’s choppy waters. What I disliked more than anything was the art, though- Booth and Rapmund give us page after page of what looks like Rob Liefeld trying to draw manga, with constant chin-in-chest posing, limbs splayed and flying in all directions, completely unconvincing figure drawings, especially when it comes to the few people that wore normal clothing, a minimum of facial expressions, and that oh-so-scrtachy Image-style inkline that makes my eyeballs bleed. I kept wishing someone with some sort of genuinely dynamic and clever style could have gotten hold of this script, instead of the people that wound up with it. While I made it through and was moderately entertained, I can’t recommend this for anyone who isn’t already committed to following along with this stuff. Sure do like that cover, though. The All Purpose Review-Writing Music List! Dave Edmunds- D.E. 7th, Information; Rockpile- Seconds of Pleasure; Bette Midler- Songs for the New Depression; Barclay James Harvest- XII; Fanny- Mother’s Pride. As always, domo arigato for reading, and god willing, I’ll be back next week.